Working at the Baptist Medical Center in Nalerigu Ghana was a whirlwind. We started work as soon as we landed in Nalerigu. That day we did evening rounds, where Dr. Morehouse our pediatrician and I rounded on the new pediatric admissions, about 10-15pts. I learned how to distinguish mild from severe malaria and feel for splenomegaly in an infant. Each day started at 730, where our team would round on up to 40 patients each. The other resident and I would ask questions of Dr. Morehouse and Waite who were incredible teachers. 3 days a week we would have clinic in the afternoon. The outside waiting area would be full of hundreds of patients, and together with the local doctors and medical assistants we would slowly work our way through, stopping periodically to attend to the emergency cases who would arrive on a stretcher. Tuesdays and Thursdays were designated OR days, where the other resident and I would alternate scrubbing in on cases with Dr. Waite or another of the local physicians. 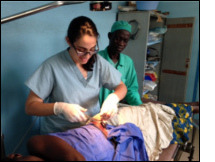 I was able to assist with typhoid perforation repairs, multiple gynecological procedures and 5 c-sections. As I am also training to do c-sections as part of my residency training I was also able to do 3 c-sections under the guidance of Dr. Victoria, the local medical supervisor. Every evening, we would return to the hospital after dinner to round on all the new admissions. We also took call every 4th evening. Overall we worked constantly, learned as though we were drinking from a firehouse, and felt like we were impacting people's lives every day. I also really enjoyed meeting people from Ghana and Nalerigu who were kind and very funny. Thank you very, very much for the support. It made the experience possible!